*Seven bits of advice accumulated after a few years of work on two continents. 1. 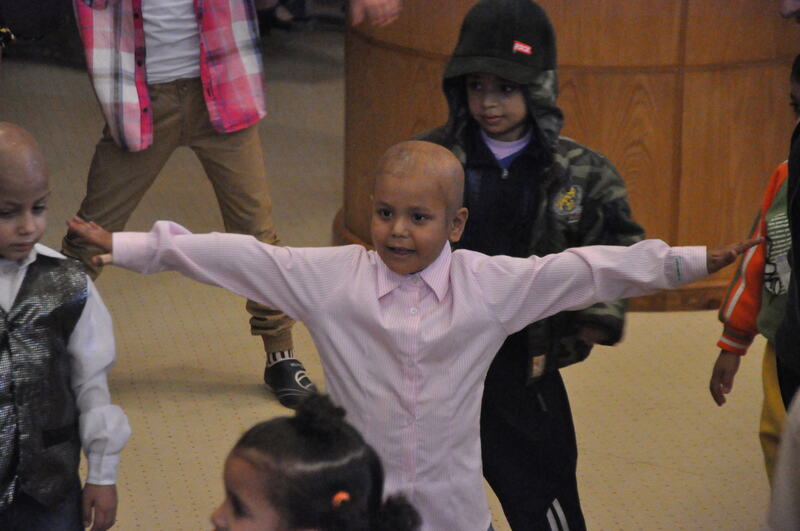 Dance with the kid, not the cancer. Smile and look them in the eyes, not in the tumors. Some will look sick, some won’t. Doesn’t matter. Play with the kid as you would any other child that age. Don’t patronize or fake a smile. Bring your boogie. Bring your own joy. 2. Dance with their physical abilities, not their limitations. Most patients have some sort of physical challenge they are needing to overcome due to their treatments (nausea, loss of balance and coordination, pain in one leg, inability to hop or run, on crutches or in wheelchairs, favoring one side, etc.). Their challenges come and go. Start with their abilities. Introduce movements that can be modified and made fun for all participants. But also push them a bit to go beyond what you or they think their bodies can do. 3. Leave out your own fears of death. Terminality (I think I just made up that word) is a part of life. Realize you will lose patients and those who survive may have life-long side effects from their treatments. Choose your words wisely and don’t assume you know how they feel. Keep religion out of it as that is the role of other adults in their lives. Help these children “live until they die” as my wise friend once said. And if a child’s lifetime is short and comes to an end, continue to say his or her name. Stay in touch with the family. Also realize that when a dancer stops attending your workshops, it could be a very good thing. Remission. You can work towards a performance but be very flexible because circumstances can change in an instant. 4. Get the whole family on the dance floor. 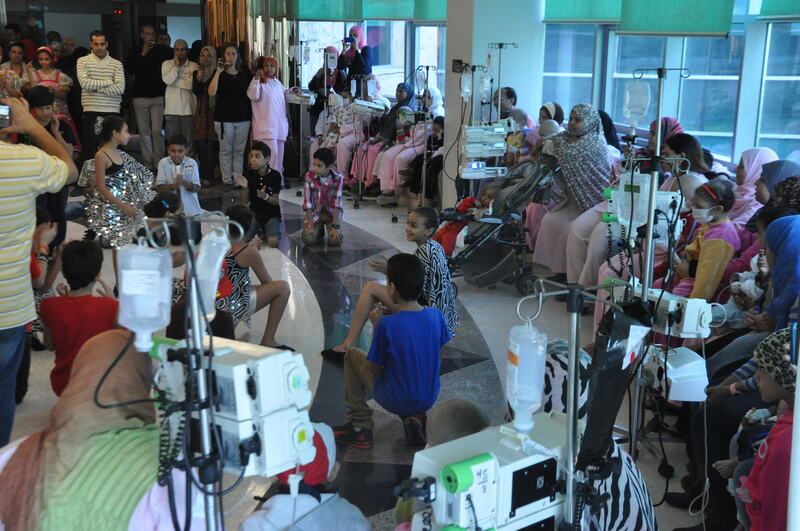 Parents, nurses, siblings, volunteers, doctors, therapists, staff, visitors… the whole hospital family. Have a few chairs available if some patients or adults may need to sit down; but even if seated, every one in the room participates. That’s the rule, given with a smile. Focus on (re)developing balance, coordination, upper/lower and brain/body connection, dexterity in ankles and wrists, cross-lateral movement, core strength, stamina and stretch/stillness. Use activities for a range of ages. Remember that the cancer is the beast within, so facilitate movements that bring these kids back in love with their body after surgeries, radiation, chemotherapy, and other treatments. Learn from dance therapists, physical/occupational therapists, and Brain Dance. But none of these areas are enough for what you will be doing. You will need a broader, more joyful palate of activities to dance with the group. Don’t smoke anywhere near the hospital or workshop venue. Wash your hands before and after the session (don’t forget thumbs and fingertips). If you feel like you have a bug of any kind, wear a face mask. Model healthy eating and self confidence. Limit physical contact between dancers. Check the room for any slippery spots, sharp edges or other dangers. Donna Quirke Hornik and I at Performing Arts Limited studio in Chicago, IL. 2009. Ask questions and listen to the answers. Keep the session calm and organized so that, together, you can follow the curiosity or burst into laughs. These kids know have to have fun. Learn from them. You will be the better for it. Do They Dance in Dagestan?